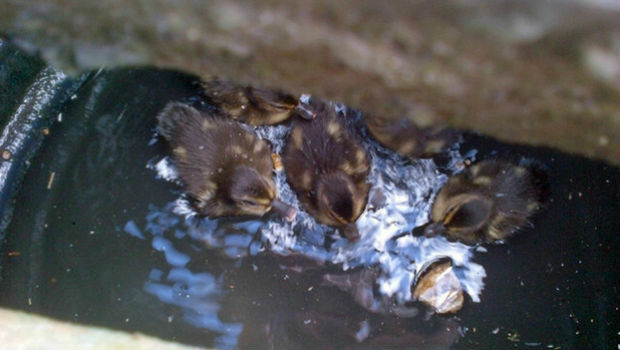 Nine baby ducklings have been rescued by the SSPCA after falling through a grate into a drain. A member of the public spotted the newborn ducklings running around on the B921 between Kinglassie and Lochgelly in Fife and noticed their mother lying dead by the roadside. An SSPCA rescue officer came out and managed to locate them before scooping them out of the drain using a small net and taking them to the national wildlife rescue centre in Fishcross. “Thankfully it wasn’t too big a drop, around an arm’s length, and the ducklings didn’t seem fazed. I had no way of opening the drain myself but I was able to scoop them out using a very thin net. It’s very sad that the ducklings’ mother was killed on the road but they are doing well with us and getting all the care and attention they need.